Purple deadnettle’s scientific name Lamium purpureum has the Greek translation ‘the devouring purple monster’. The name is perfect to describe the effect the weed has on its environment. It is an annual winter weed in generally warm areas, which transforms entire plowed farmed lands into reddish purple fields. It has multiple medicinal purposes, and is considered a diuretic, diaphoretic, astringent, purgative, and styptic. The fresh leaves are helpful for external wounds or cuts. Distinguishing Features: The purple deadnettle leaves are considered dead, and there are no stinging hairs. 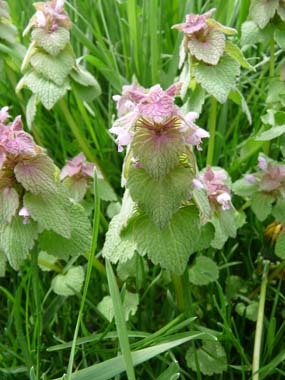 It is a member of the mint family, which is distinguished by the purple deadnettle’s four-sided square stem. 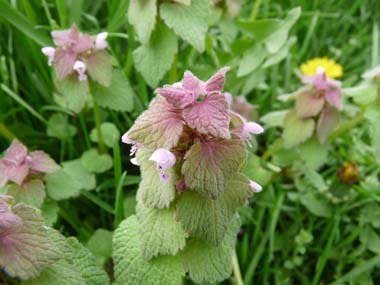 The purple deadnettle is closely related to the henbit, which is often referred to as the henbit deadnettle. The green henbit leaves are kidney shaped and are attached directly to the stem, whereas the purple deadnettle has a triangular shape, and the stalk is attached to the stem’s leaf blade. Flowers: The purple deadnettle has distinctive pink flowers which will typically bloom in April, and they last for about six weeks. At that point it produces four nutlet seeds, which can be used to replant for additional growth. The flowers are tubular in shape, and the upper and lower lip ends will incline toward each other. Bees are also known to enjoy the pollen and nectar of the flowers. Fields of Nutrition has medicinal benefits and vitamin/mineral content of Purple Deadnettle. Leaves: Purple or red is the colour of the upper leaves. The leaves appear similar to the stinging nettle. The leaves appear crowded around the stem’s axis. The dried leaves can be used as an effective poultice to end any hemorrhaging. Height: This plant can grow as high as 30 cm and about 18 cm wide under the perfect conditions although they can be quite short as well. 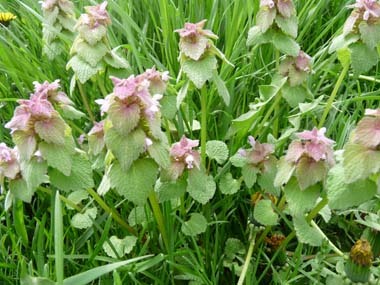 Habitat: Purple deadnettle tends to grow on roadsides and waste places; however, it is also commonly grown as well. They are common throughout Europe, especially Britain, Israel, Norway, northern Africa, western Asia and the Mediterranean. It was introduced to the U.S. and Canada and now grows in many areas throughout both countries. Edible parts: Only the leaves are edible. In the spring, the young leaf shoots are harvestable and can commonly used within salads. Some people also use it within smoothies. The leaves are also useful as a good tea, which helps treat chills and promote kidney discharge and perspiration.